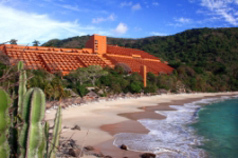 Las Brisas Ixtapa in Ixtapa-Zihuatanejo, Mexico is nestled on a hillside with beautiful tropical gardens and the guestrooms overlook the dramatic Mexican Pacific making it a perfect place to relax, to dream, and to revitalize the senses. In July 2007, the 416-room and suite hotel finished a 2-year renovation project costing $20.5 million US, and the results are stunning. 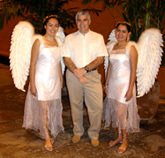 Edward F. Nesta and I stayed at Las Brisas Ixtapa in December 2007, and were impressed with the hotel from the minute our driver drove up the cobblestone entry framed by brightly hued hibiscus in shades of red and yellow with a large fountain as the focal point. Entering our spacious deluxe ocean view room located on the top floor of the hotel, I spotted the ample terracotta colored terrace across the room, and immediately headed outside where a white hammock beckoned invitingly among the large pots of fuchsia bougainvillea. When my eyes saw the dazzling view of the wide stretch of white sandy beach where the waves lapped the shore creating its soothing sound, I knew that this would be my favorite place in the hotel. 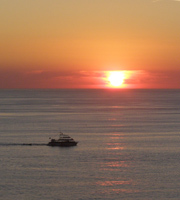 During our stay, Edward and I enjoyed sitting on the terrace on the teak chairs watching the sunset or drifting off for a nap in the hammock lulled to sleep by the sound of the waves. The large guestroom featured a pillow-top king bed with a wood headboard dressed with pristine white linens and a brightly colored embroidered pillow, and there were nightstands on either side of the bed and large lamps with lime green shades. Opposite the bed, there was a large wood framed mirror over the long bureau, which held a coffee maker, a television with Internet access via a keyboard, a mini-bar, and there was a tall floor lamp with a jute wrapped shade placed in the corner of the room. Other amenities included air conditioning as well as a ceiling fan, a scale, and a large safe in the closet. Just beyond the bedroom there was an intimate sitting area with a wood framed mirror hanging above a taupe sofa built into a niche that was accessorized with taupe, lime green pillows, and a large embroidered colorful pillow. On the opposite wall, there were two lime green slip covered chairs flanking a glass top wood table, which held an assortment of magazines and a plate of tempting sweets. The limestone bathroom featured a large wood framed mirror over the vanity, which held a philodendron plant, a hairdryer, vanity/shaving mirror, and a basket of Gilchrist & Soames amenities adorned with fresh hibiscus flowers each day. The walk-in shower featured a square shaving mirror, an overhead showerhead as well as a hand-held shower and a bench. 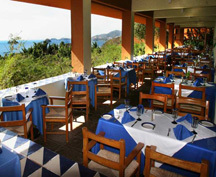 The hotel has 6 restaurants and 4 bars, and we thoroughly enjoyed beginning our day by having breakfast in the Bellavista Restaurant with its striking vista of the treetops where we watched the birds, and the sensational view of the Mexican Pacific and the large outcropping of rocks offshore. Made-to-order omelets and a buffet menu offering hot and cold Mexican specialties awaited us each morning along with attentive wait staff. In the evening, we enjoyed listening to the live music in the Lobby Bar, which also has breathtaking views. We had a wonderful dinner at the elegant El Mexicano Restaurante, which features gourmet Mexican cuisine where a few of the specialties we experienced included Arrachera, Brocheta de camarón, New York, Quesadillas de flor de calabaza, queso, champiñón, ensalada se nopales, cebolitas assadas, queso fundido con chorizo, guacamole y frijoles. 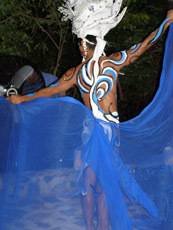 During our stay we were fortunate to be able to attend a special evening performance of the Four Elements, which began with a cocktail reception outside where we were greeted by two angels and entertained by the element, Air, a dancer painted with blue who swirled large blue sheer fabric creating a gentle breeze as he danced on the deliciously warm evening. The night, and fairy light lit trees, where we found the element, Fire, followed by the element, Earth, and lastly the element, Water, who danced amidst a waterfall. We dined under a starry sky at a round table draped with a beige fisherman's net and accessorized with yellow roses in a square glass low bowl set in sand with a square white candle, where round white paper lanterns were strung across the large courtyard from the trees. The Four Elements menu consisted of Earth: Beef and Shrimp Carpacchio with Arugula Salad and Old Mustard Vinaigrette; Air: Pate and Wild Rice stuffed Quail with Red Wine Warm Sauce; Water: Fish Fillet and Lobster in a Basket of Parmesan Cheese with Mushroom Stew in Pink Sauce; and Fire: Thousand Leaves Chocolate with Fig Ice Cream and Marsala Wine. A musical and dance performance created a wonderful ambience during dinner, followed by after dinner dancing by the guests, with yours truly being the first dancer as I was led to the dance floor by the waiter, not wanting to disappoint him, I danced, and had a ball, as we encouraged other guests to come and join us on the dance floor. 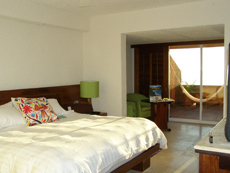 Offering guests 4 outdoor swimming pools, 4 lighted tennis courts, a fitness center, a private sandy beach, business center, shops, meeting rooms, and a beauty salon, Las Brisas Ixtapa is perfect for either leisure or business guests. 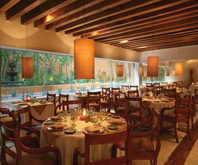 Please read more about Las Brisas Ixtapa in the Restaurants and Chefs' Recipes sections.